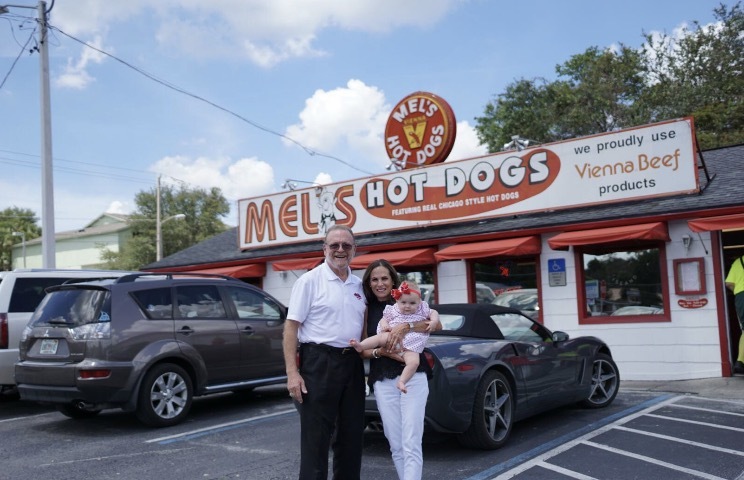 Mel's Hot Dogs has been family-owned and operated since it opened back on July 3rd, 1973. The restaurant is located next door to Busch Gardens, on the corner of Busch Boulevard and 42nd Street. 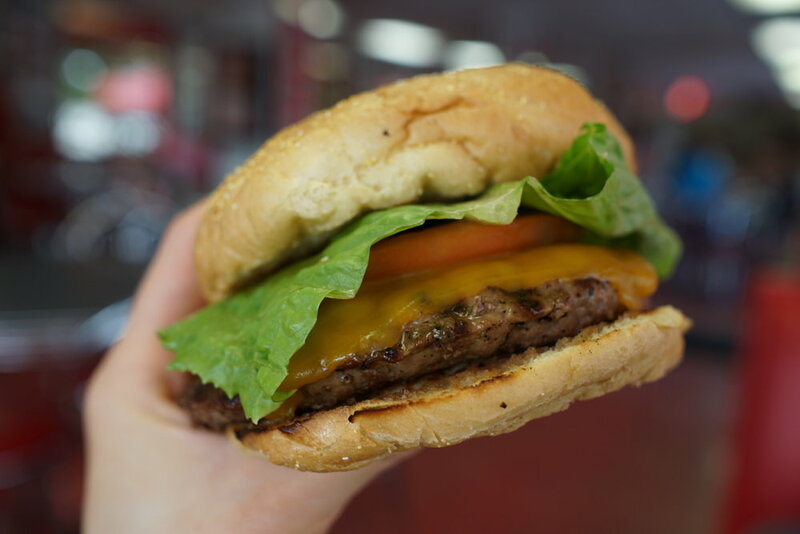 We pride ourselves in serving the highest quality food with a side of Mel's legendary humor! Aside from sitting down and enjoying a great meal inside the restaurant, we also offer carry out ordering and catering services. We look forward to seeing you soon! Mel's Famous all beef natural casing hot dog served on a steamed poppy seed bun with mustard, onions, sauerkraut, relish & pickle. Mel's Famous all beef natural casing hot dog served on a steamed poppy seed bun with the toppings of your choice. Mel's Famous all beef natural casing hot dog served on a steamed poppy seed bun with mustard, onions, relish, pickle, tomatoes, celery salt and hot sport peppers. Mel's Famous all beef natural casing hot dog served a steamed poppy seed bun with beef chili. Mel's Famous all beef natural casing hot dog served on a steamed poppy seed bun with your choice of melted American, Swiss, or Cheddar cheese. Mel's Famous all beef natural casing hot dog served on a steamed poppy seed bun topped with Thousand Island dressing, warm sauerkraut, and melted Swiss cheese. Mel's Famous all beef natural casing hot dog served on a steamed poppy seed bun with melted Cheddar cheese and two slices of crispy bacon. Mel's Famous all beef natural casing hot dog served on a steamed poppy seed bun topped with our delicious homemade coleslaw. A large 1/4lb. skinless version of Mel's Famous hot dog served on a steamed poppy seed bun with mustard, onions, sauerkraut, relish, and pickle. A large 1/4lb. 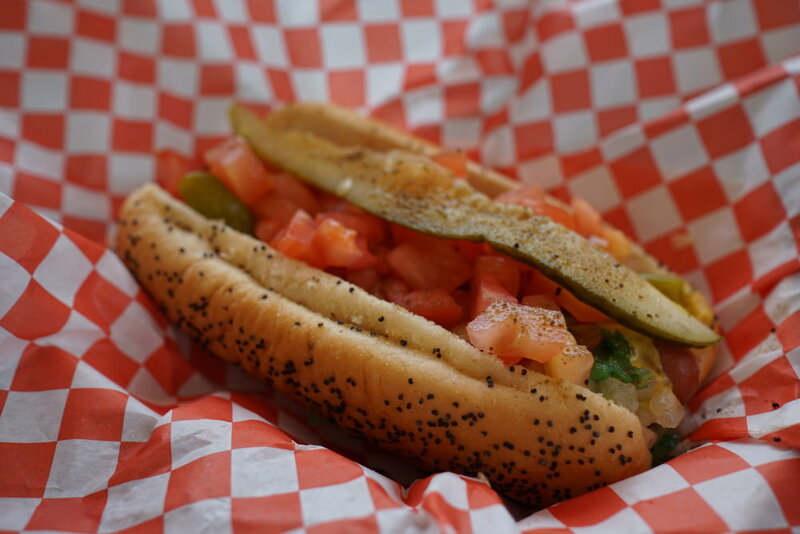 skinless version of Mel's Famous Chicago Style hot dog served on a steamed poppy seed bun with mustard, onions, relish, tomato, celery salt, and hot sport peppers. For the less hearty appetite, a skinless hot dog smaller than the Mel's Special. Served with mustard, onions, sauerkraut, relish, and pickle. 70% less fat all beef hot dog starting at only 120 calories. Served on a steamed poppy seed bun with mustard, onions, sauerkraut, relish, and pickle. A meatless hot dog made from soy protein, wheat gluten, and natural flavorings served on a steamed poppy seed bun with mustard, onions, sauerkraut, relish, and pickle. Mel's version of this traditional favorite starts with an all beef hot dog dipped in the finest whole grain stone-ground cornmeal batter and then fried to a delicate golden brown. A large 1/4lb. beef sausage made with spicy cayenne pepper served on a steamed hoagie bun. Served with brown mustard, grilled onions and bell peppers and hot sport peppers. Mel's renowned grilled all beef Polish Sausage served on a steamed poppy seed bun with spicy brown mustard and smothered with grilled onions. Mel's renowned all beef Polish Sausage wrapped in a delicious poppy seed bagel dough. Served with mustard, tomato, and pickle. Our baskets include your choice of sandwich, a large order of our crispy golden brown French fries, and a medium drink. Thinly sliced roast beef served on a steamed hoagie with sautéed red bell peppers and topped with traditional Chicago spicy au jus. Giardiniera (very hot) topping is also available. A 1/4lb. blend of pork and veal natural casing sausage served on a steamed hoagie bun with spicy brown mustard and warm sauerkraut. Spicy pork sausage grilled and served on a steamed Italian loaf with grilled onions and bell peppers. Thinly sliced roast beef and a spicy pork sausage combo served on a steamed hoagie with bell peppers and spicy au jus. Chicken breast fillet lightly breaded and fried. Served on a steamed Kaiser roll with lettuce and tomato and choice of mayo, honey mustard, BBQ, or ranch. Skinless Chicken breast fillet charbroiled. Served on a steamed Kaiser roll with lettuce and tomato and choice of mayo, honey mustard, BBQ, or ranch. Charbroiled 100% black Angus 1/3lb. ground chuck burger served on a steamed Kaiser roll. Served with mustard, ketchup, mayo, onions, relish, pickle, lettuce and tomato. A delicious meatless no-cholesterol veggie burger served on a steamed Kaiser roll. Served with mustard, ketchup, onions, relish, pickle, lettuce and tomato. Your choice of an all beef snack dog, chicken nuggets or an American cheese sandwich with a small order of fries, a small drink and a surprise! Classic Coca-Cola, Diet Coke, Cherry Coke, Root Beer, Sprite, Lemonade, Fruit Punch, Pibb, and Brewed Iced Tea. 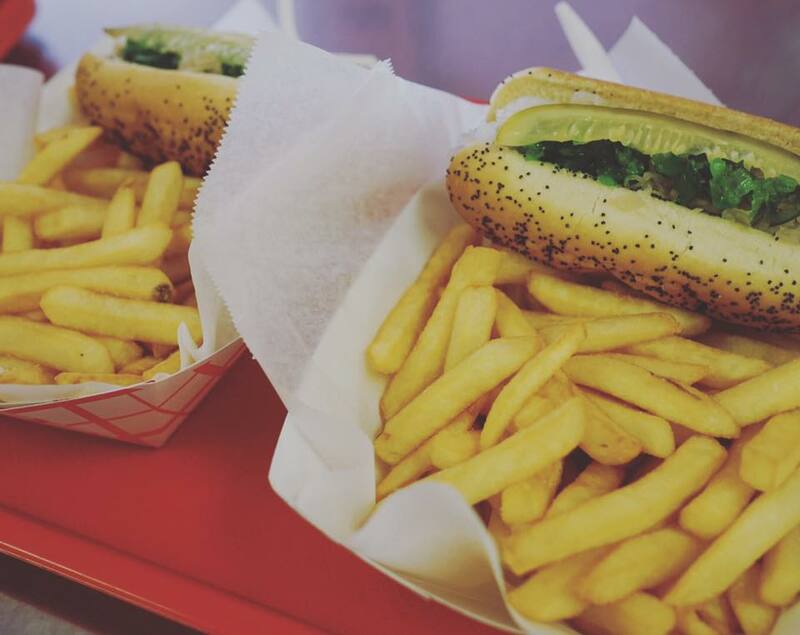 Mel's Hot Dogs started with one Chicagoland hippie and a major case of the munchies. Back in the early 1970s, Mel was touring the Sunshine State with his Rock 'n' Roll band. With their afros picked and American flag unitards packed (yes, there are photos to prove it), Mel and the motley crew of musicians moseyed from gig to gig in a hollowed out old school bus. After one particularly late night, Mel traveled Tampa in search of the comfort food of his hometown: the Chicago-style hot dog. A quick trip turned into a futile voyage, resulting in a hangry man with a grand vision. Mel couldn't believe it- not a SINGLE hot dog stand in the entire city of Tampa? His fair Chicago had stands on every city block. Ever the entrepreneur, Mel saw an opportunity. On July 3rd, 1973, Mel's Hot Dogs opened up shop on the corner of 42nd Street and Busch Boulevard. The rest is history! Mel's daughter, Anjuli, appeared on 970WFLA with Jack Harris and Tedd Webb to celebrate National Hot Dog Day. Listen in by clicking the link above! Fox 13's Charley Belcher visited Mel's Hot Dogs for National Hot Dog Day! Mel's Hot Dogs on AME TV! Mel's Hot Dogs on "Hot Dog Stories"!